Pockets of mist and steam rolled over the rim of an approximately 100-foot-deep crater. 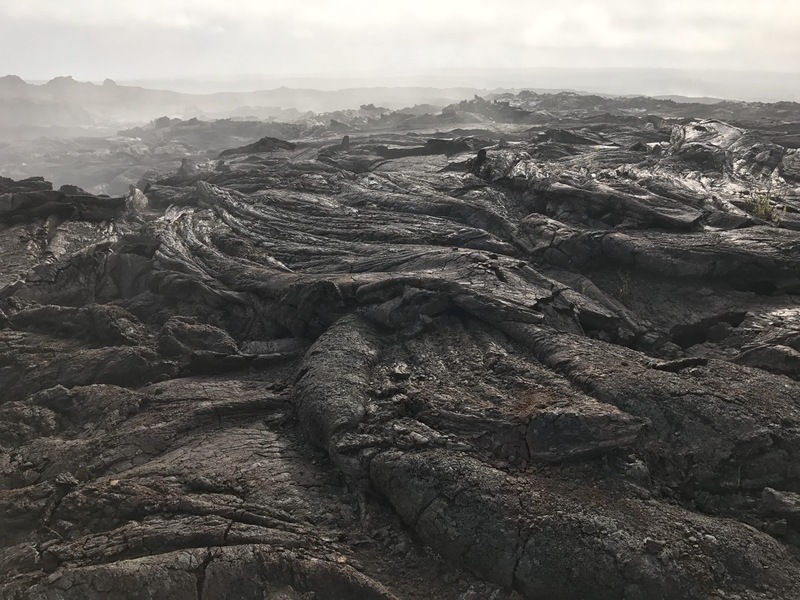 Fingers of charcoal gray lava rippled around its gaping mouth like giant earthworms, fissured but shimmery under the sun that poked through the patchy fog. ‘Astronauts’ navigated a pre-plotted path between crags and crevices—the crunch of their boots on the warm lava rock like the sound of stepping on crispy chocolate chip cookies, says Michael Miller, a NASA engineer and communications and backpack development lead. “With the cloudy skies and all, it really seems like we’re not on Earth,” Miller says. But this isn’t another planet, and these are not astronauts. This alien-like crater resides on the Big Island of Hawaii. 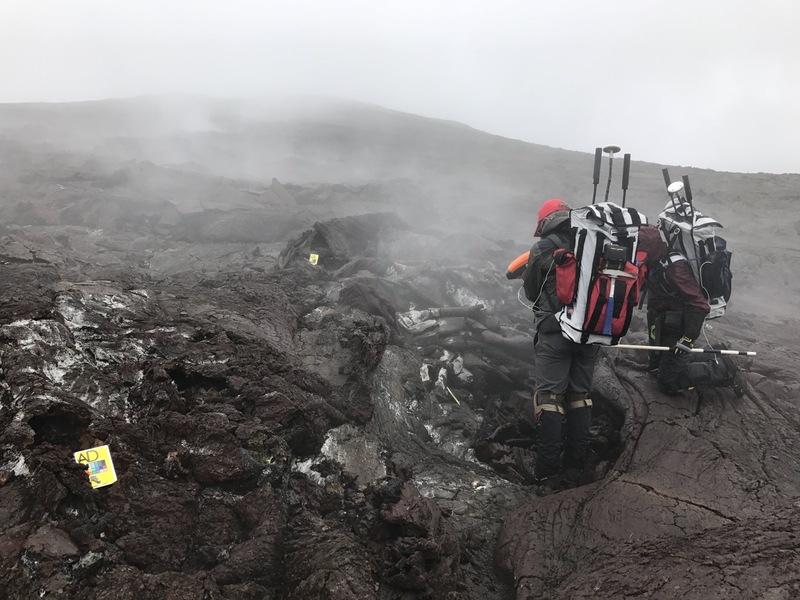 Miller, along with principal investigator Darlene Lim and a team of around 50 NASA researchers, simulated what it would be like conducting missions on Mars at Mauna Ulu, an almost 400-foot-tall volcanic crater in Hawai’i Volcanoes National Park. Last November, SciFri ventured out to the edge of the crater with the NASA researchers to see what challenges real astronauts may face on Mars. The weather on this particular field day is unusual with the whipping winds, and fog and mist coating research equipment. Mauna Ulu crater is akin to a young Mars—a wetter, warmer planet that existed between three to four billion years ago. The lava beds contain the same kind of iron-rich basalt found on Mars, making it an ideal environment for NASA’s project, fittingly called BASALT, or Biologic Analog Science Associated with Lava Terrains. 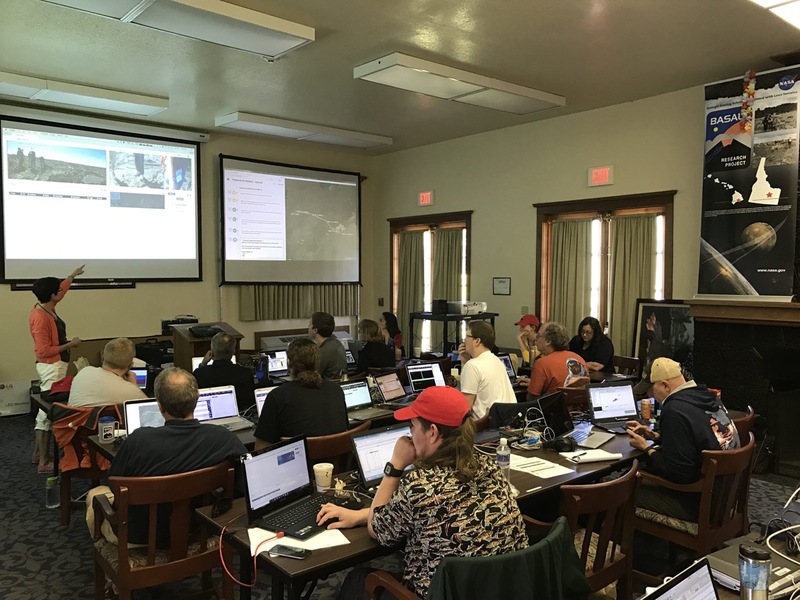 To be as prepared as possible for a future manned mission to Mars, the BASALT team set up a three-part simulation, with astronauts sampling rocks in the field, other astronauts guiding them from a simulated Mars habitat, and a mission control on Earth. Out on the lava beds, the crew wore GoPro cameras on their chests, 40-pound packs, and carried two tools that look like ray guns. One identified minerals and a second determined elements in rocks. The astronauts’ mission: to survey which basalt rocks are the most scientifically interesting samples, and determine which ones to bring back to the Mars Hab. A lot of deliberation will go into selecting which Martian rocks astronauts may someday want to fly back to Earth for further study—because cargo space is precious. The astronauts consult with the scientists both at the Mars Hab and mission control to make these crucial decisions. However, the scientists back on Earth are unfortunately faced with one of the biggest struggles of future Mars missions: communicating with the astronauts, where one-way time delays range anywhere from four to 24 minutes. “It’s like you’re living in the present but you have to affect the future, and that future is actually already the past,” says Darlene Lim, NASA’s principal investigator of BASALT. Round-trip communication between the Earth and the Moon takes only seconds. But depending where Earth and Mars are in their orbits, the same roundtrip communication to Martian astronauts could take nearly 45 minutes. While the scientists of BASALT know their feet are Earth-bound, the remote crater in Hawai’i transports them to another world. For Rick Elphic, a NASA geologist on the BASALT team, exploring the lava beds is the next best thing to setting foot on Mars. Michael Miller is a co-investigator and the communications and backpack development lead for BASALT. He’s based at NASA’s Kennedy Space Center in Florida. Darlene Lim is a geobiologist and Principal Investigator of SUBSEA (Systematic Underwater Biogeochemical Science and Exploration Analog), based at NASA Ames Research Center in Silicon Valley, California. Rick Elphic is a collaborator in EVA crew/science support for BASALT. He’s at NASA Ames Research Center in Moffett Field, California. Kara Beaton is a co-investigator in Ops and Exploration for BASALT. She’s at the NASA Johnson Space Center in Houston, Texas. Shannon Kobs-Nawotniak is a volcanologist for SUBSEA (Systematic Underwater Biogeochemical Science and Exploration Analog). She’s based at Idaho State University in Pocatello, Idaho. Venture to the southern coast of the Big Island in Hawaii and what you’ll see is some of the most primordial landscape on Earth– fresh lava oozing into the ocean, casting up a plume of volcanic steam, huge expanses of black lava crust, and active steam vents with sauna-like temperatures. Scientists believe the surface of Mars may have been similar 3 to 4 billion years ago, when the planet was warmer and wetter than it is today, which makes Hawaii an ideal place to study geology similar to ancient Mars and a place to model a mission to the red planet too. 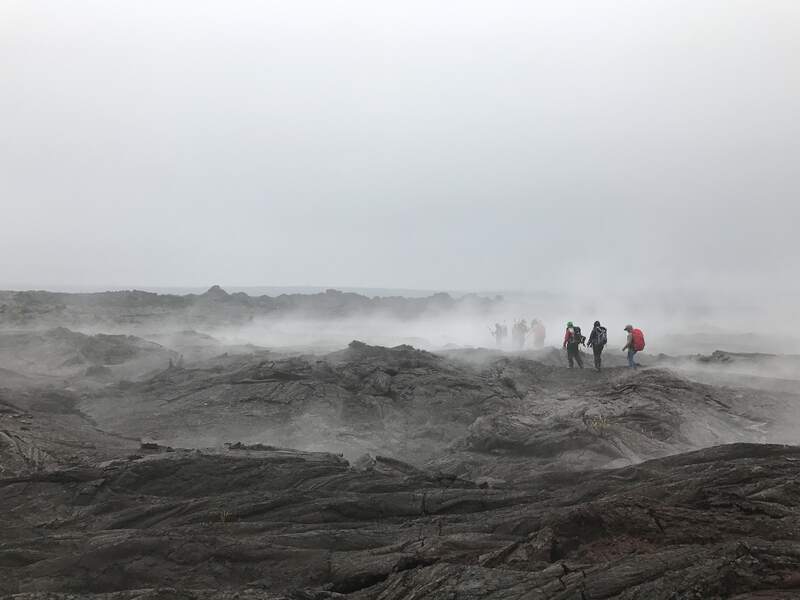 NASA simulated the three parts of a human-led scientific mission– the field work, the habitat, and ground support back to Earth– in Hawaii Volcanoes National Park. Science Friday Producer Christopher Intagliata joined them there. 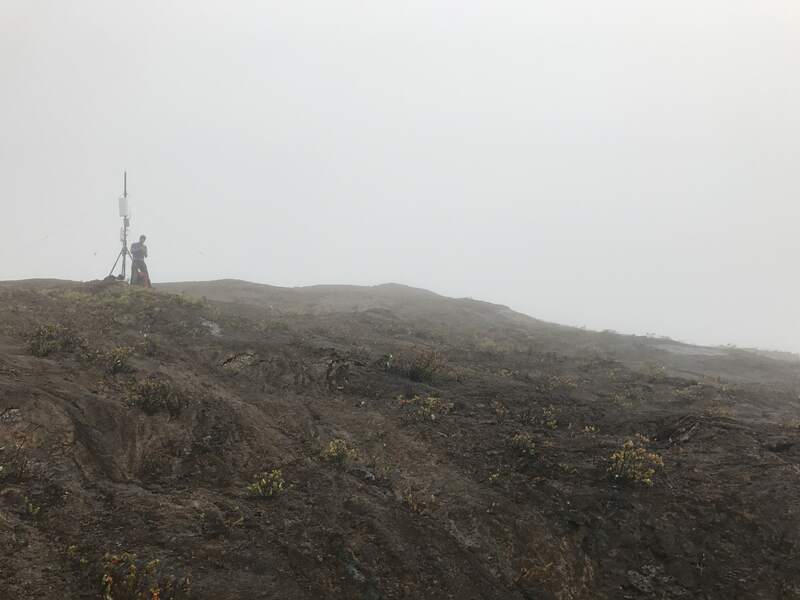 CHRISTOPHER INTAGLIATA: It’s hard enough to troubleshoot wireless networks and configure IP addresses from the comfort of your couch, but NASA’s Mike Miller, he’s doing it in whipping wind, mist, and fog on the edge of a crumbly volcanic crater. SPEAKER 2: Miller just lost everything. SPEAKER 1: You’re kidding. All right, getting the laptop out. That doesn’t sound good. MIKE MILLER: It’s a Toughbook, but it’s a mild Toughbook. So trying to figure out how tough it is. And I don’t want to find out the hard way, because it’s the only one we have in the field. CHRISTOPHER INTAGLIATA: Mike’s based at the Kennedy Space Center. But his job site today, the Mauna Ulu Crater in Hawaii Volcanoes National Park on the Big Island. The ground is so hot in places, it’s steaming. In fact, Mike is sitting next to one of those volcanic vents right now. MIKE MILLER: It feels really good right now. CHRISTOPHER INTAGLIATA: The rig he’s setting up looks like a mini cell phone antenna. Mike says it’s a lot like the rugged communications hubs we might set up for the first Martian astronauts. And the lava landscape around us recalls the volcanic views on Mars, but the ancient Mars, billions of years ago, when the planet was warmer and wetter than it is today. The charred crust around the crater has huge folds and ropes of shiny black dried-up lava. It’s brittle, and crunches under our boots. MIKE MILLER: They’re like really crispy chocolate chip cookies. 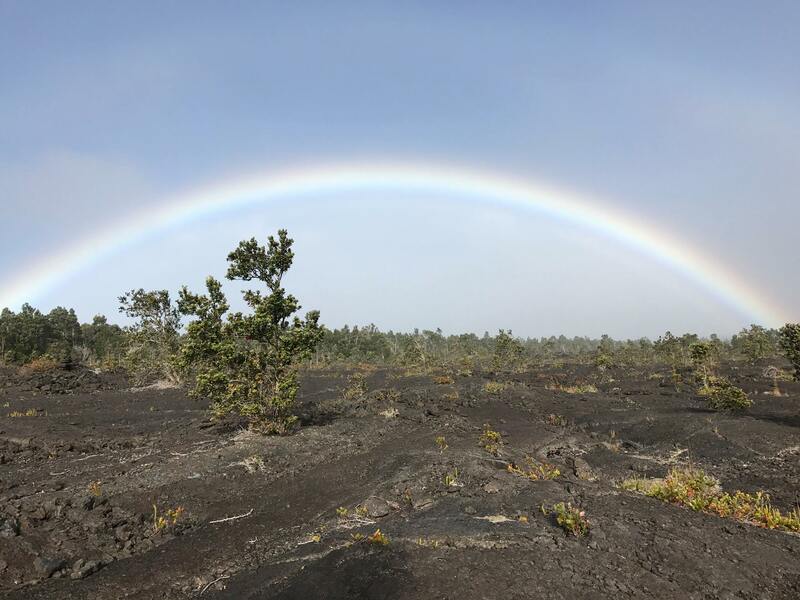 CHRISTOPHER INTAGLIATA: When we hiked out here this morning, it was Hawaiian license plate weather, clear skies and a big rainbow over the lava fields. Now, everything’s foggy and wet. But Mike’s optimistic. MIKE MILLER: I have a feeling Mars is a little bit more miserable than mist and fog. CHRISTOPHER INTAGLIATA: And Mars is why we’re here, because this communications rig is one small part of a bigger mission to model a human-led scientific trip to Mars right here on Earth, on the side of an active volcano. The project’s called BASALT. That’s a geology joke. And it stands for Biologic Analog Science Associated with Lava Terrains. And it’s a three-part simulation. The first part, astronauts roaming the lava doing field work. Second, another set of astronauts in the Hab, the Mars colony. And then there is ground support back on Earth. That’s where I caught up with NASA’s Darlene Lim. She’s the principal investigator. DARLENE LIM: A lot of times, I start into the whole process of the fact that we’re doing real science under simulated Mars mission conditions, and then right away, I get asked well, do you have spacesuits? CHRISTOPHER INTAGLIATA: They don’t. But this mission models nearly every other challenge a scientific mission to Mars might face, including a big one, the massive time delay in communications between Earth and Mars. DARLENE LIM: You’re looking at anywhere between a four to about a 24-minute one-way delay between when you say hi and the other person receives that hello and you need to figure out what to say in return. CHRISTOPHER INTAGLIATA: The delay varies, depending where Earth and Mars are in their orbits, but worst-case scenario, about 45 minutes to say hi and get a hello back. So for NASA Mission Control, accustomed to just a couple seconds round-trip delay between the Earth and moon, this is a game-changer. DARLENE LIM: What we’re proposing is a paradigm shift from what is currently done in the human spaceflight community. It’s like you’re living in the present, but you have to affect the future. And that future is actually already the past. CHRISTOPHER INTAGLIATA: And that mind-bending scenario is why NASA gathered a team of 50 people here last November to simulate that logistical headache in a real-mission setting, with the same sorts of all-stars you might actually want to send to Mars– geologists, biologists, chemists, computer coders and electrical engineers, educators, roboticists, and experts on human physiology and performance. There is a former astronaut too. For the next 10 days, they’ll test comms equipment and time delays and reimagine what happens when Mission Control loses some of that real-time control part. And there’s one more twist. This mission is also doing real science, astrobiology studies on how rock and water interact and which lava rocks are the best hideouts for life. It’s work that could someday determine which rocks astronauts turnover on Mars. The stakes are high. Today’s scientific mission begins with two astronauts out on the lava beds, the first part of the simulation. We hiked down to join them once Mike’s comms equipment boots up. KARA BEATON: We want some hot chocolate when we get back into the habitat. CHRISTOPHER INTAGLIATA: That astronaut is Kara Beaton. She is an engineer from Johnson Space Center. KARA BEATON: Hey, Mike It’s Kara. I got you loud and clear. RICK ELPHIC: [? KC ?] comm to [? EB ?] [? 2. ?] Loud and clear. CHRISTOPHER INTAGLIATA: Her fellow astronaut is Rick Elphic, a NASA geologist. They’ve got kneepads, iPhones strapped to their left arms, laminated flipbooks of instructions on their right arms. They’ve got video cameras on their chests, too, and 40-pound packs. Antennas shaped like corn dogs and mushrooms stick out the top. They are fully loaded. KARA BEATON: OK, good morning from the field. I believe we are standing on waypoint zero right now. I do have tracking on both of us, on my wrist display. 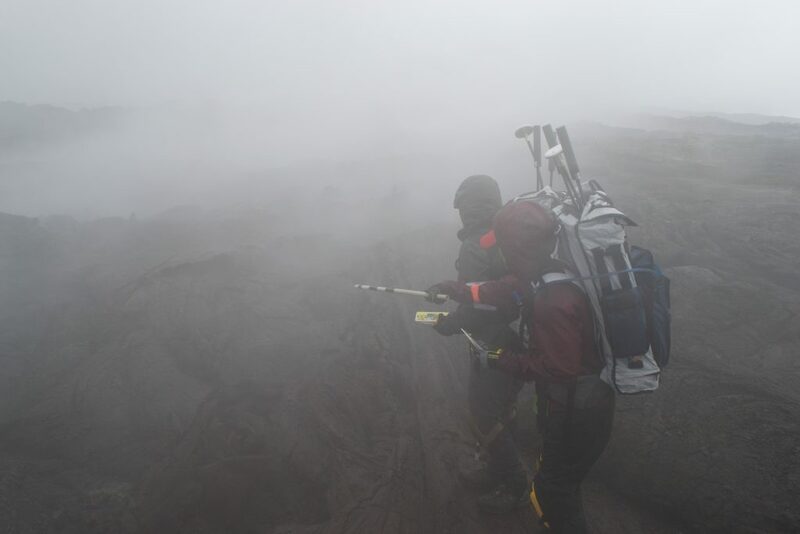 CHRISTOPHER INTAGLIATA: Kara and Rick are walking a preplanned traverse across the lava. And they’ll stop at sample sites Alpha, Bravo, and Charlie along the way. At each site, they’ll take pictures and describe rock samples. And they’ll identify the minerals and elements in the rocks using ray gun looking things that shoot infrared light and X-rays. Kara is getting a reading now. KARA BEATON: Gmelinite dash sodium, three stars. Montmorillonite. CHRISTOPHER INTAGLIATA: Kara’s descriptions travel back in real time to the other Martian astronauts in the Mars Hab. CHRISTOPHER INTAGLIATA: The Hab is actually a back office at the Kilauea Military Camp. And it is the second part of this simulation. Shannon Kobs Nawotniak is one of those Martians. SHANNON KOBS NAWOTNIAK: Welcome to Mars. You are now a Martian. Are you ready for some good potatoes? I hear we have them. CHRISTOPHER INTAGLIATA: She’s a geologist at Idaho State University. SHANNON KOBS NAWOTNIAK: And I’m the scientist in the equivalent of the Mars habitat, helping give science guidance to the astronauts as they’re walking out on the surface. CHRISTOPHER INTAGLIATA: Under the mission scenario, Shannon made the years-long journey to Mars too, along with Kara and Rick. But she gets to hang out in the Hab today, which helps her focus on the science. SHANNON KOBS NAWOTNIAK: I’ve got plenty of air. I’m not as stressed physically. And I can write things down. So I have a larger context view. It’s my job to be their memory and to feed that back to them when they need it. And at the same time, condense the information down to the most critical parts, from a scientific perspective, and send it back to the Earth. CHRISTOPHER INTAGLIATA: Today’s experiment is running with a 15 minute one-way communications delay back to Earth. So everything you just heard the astronauts saying out in the field, the mineral IDs the hot chocolate order, Shannon heard it, ’cause she’s on Mars time. But no one on the Earth part of this simulation even knows that happened yet. In fact, with this delay, if you sent a message from Mars at the beginning of this story, right now, it would only be halfway to Earth. Shannon, in the Mars habitat, is that link between the astronauts out sampling and the hive mind of a dozen geologists and biologists back in Mission Control. That’s the third part of the simulation, happening in a big conference room at the military base. The scientists are on Earth time. And they’re desperately waiting to hear which rocks the astronauts sample. So as soon as the first time-delayed transmission comes in, the debate begins. SPEAKER 3: OK, Alpha Delta does not look good from this point. I can see high-temperature oxidation. SPEAKER 4: Which of these do you actually want me to scan? CHRISTOPHER INTAGLIATA: They have a leaderboard, projected on the wall, where each new rock is ranked by how interesting it seems. SPEAKER 3: OK, is everybody in the science area back here satisfied with that list as it is? OK.
CHRISTOPHER INTAGLIATA: That scientific consensus will be beamed back to Mars. And this scientific debate, Shannon says, is how real Martian astronauts may someday be guided to pick up the most scientifically relevant samples. SHANNON KOBS NAWOTNIAK: Any rock we take from Mars will be of huge benefit. But we only get limited choices. We need them to be the best possible ones. CHRISTOPHER INTAGLIATA: Of course, exploration, by its nature, means not everyone gets to go. What this research project is trying to figure out is how do you bottle up all that human experience, all that scientific expertise here on Earth, and send it tens or even hundreds of millions of miles away. How do you offload some of that mission control to the astronauts themselves, who will not only be distant, but living beyond instant communication? Principal Investigator Darlene Lim again. DARLENE LIM: You only get to send six people who are supposed to represent humanity and make discoveries for, say, maybe thousands of scientists back home. And so we are trying to make sure that the humanity is not stripped from human exploration. You have that element represented in the room in such a deep sense, you’ve got to be able to draw that out in the science team. And then you’ve got to be able to allow those that are on Mars to bear down on their experience in that way as well and bring it together to force out the most amazing discoveries. And it’s going to be science. But it’s going to be an art to it as well. CHRISTOPHER INTAGLIATA: It’ll be a while before we figure it all out. And it may be a while, too, before humans venture far enough in space to truly outgrow the idea of Earth-based mission control. But when we do, Darlene will be ready. DARLENE LIM: I would just like to see somebody go to Mars and turn over a rock. That would be a good day. CHRISTOPHER INTAGLIATA: For Science Friday, I’m Christopher Intagliata. IRA FLATOW: A simulated Mars mission in Hawaii and we have lots of beautiful photos, video, field sounds, and a great write-up by our Web Producer Lauren Young. And you can check it all out at ScienceFriday.com/Hawaii. That’s ScienceFriday.com/Hawaii. Researchers are simulating the Martian environment near a Hawaiian volcano to test how communication systems would work on the planet.